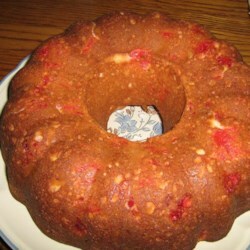 I have searched through countless Friendship Cake recipes to find this one. I received starter for this from a friend 10 years ago and I remember this being the moistest, most delicious cake that I had ever had. I was worried that it would actually taste like the holiday fruitcakes that I really don't like but instead I felt like I was in Hawaii enjoying a tropical delight. Thanks for posting this. The coconutwas a key ingredient that is not included in many recipes. I had to make the starter first this time so now it's off to Mom's group with the final product. They've been waiting 8 weeks for this ... I hope they like it as much as I do!